Product prices and availability are accurate as of 2019-04-11 21:35:54 EDT and are subject to change. Any price and availability information displayed on http://www.amazon.com/ at the time of purchase will apply to the purchase of this product. Sync data from a thumb drive, plug in USB peripherals, stream 4K video, and charge a MacBook at full speed—all from the same hub. Access 5 Gbps data transfer speeds, along with vibrant 4K HDMI streaming. USB-C Power Delivery supports uninterrupted pass-through charging. Get more done while charging your MacBook, and shatter the limitations of having a single USB-C port. • Connect to AC power by using a USB charger (not included). 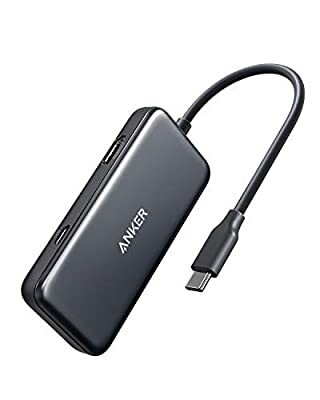 We recommend using a 60W PD (Power Delivery) charger: 51.5W for charging the connected laptop and 8.5W for powering the hub. • The connected USB devices should not exceed an input current of 1.5A. • The extended cable is 0.5 ft long. The Anker Advantage: Join the 30 million+ powered by our leading technology. 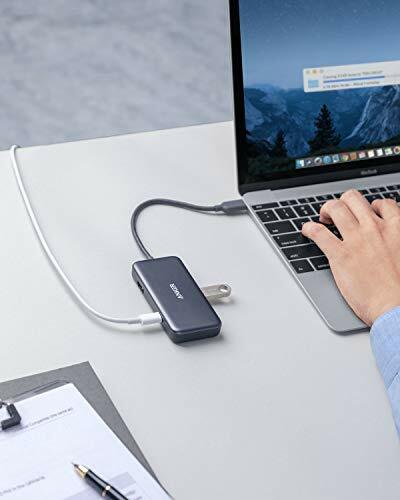 Expanded USB-C: Make the single MacBook USB-C port do more for you, with charging and USB-A connectivity. High-Speed, High-Def: Stream 4K 30Hz video, and access 5 Gbps data transfer speeds. High-Speed Charging: Enjoy pass-through charging while using the hub, with USB-C Power Delivery. What You Get: Anker Premium 3-in-1 USB-C Hub, travel pouch, welcome guide, worry-free 18-month warranty, and friendly customer service.